I am not mentally balanced enough to participate in the elf on the shelf thing. Therefore, I have not purchased an elf because my children have half my DNA, which assures me that the elf would not produce well behaved kids. It would produce shrieking nightmares and years of therapy. Go with me here: I am supposed to put a creepy looking doll with big eyes on a shelf and tell my children that it is watching them and reporting back to Santa every night. I'm to further move it around while they are sleeping, to advance the notion that the elf is, indeed, a sentient and animated being. And then we're collectively supposed to assume that none of their other dolls are sentient, animated beings (particularly their Raggedy Ann and Andy dolls, which come on: look like creatures from the bowels of hell. 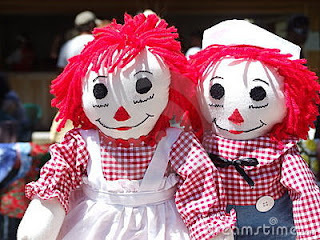 I have always thought that in any domestic murder case, the chief suspects should be the spouse followed closely by any Raggedy Ann dolls). I don't dispute that the elves are cute, in the same way that Chucky The Clown was cute, with the nitpicking exceptions of his permanent scowl and tendency to disembowel people. From a cinematic standpoint, dolls and clowns have a long history of misbehaving. Remember the Poltergeist clown? Child's Play? Saw? I just can't separate these scary toys from the tattle tale elf. How do we know the elf is good and kind? We don't. So in my house, Santa will just have to man up and do whatever he did before the elf idea came into vogue. If he knows when we are sleeping and he knows when we're awake, he can work out the naughty or nice stuff without dispatching demonic dolls.